Crawl Space Foundation Settlement is typically only damaging when it is differential, meaning portions of the crawl space foundation settle at different rates or different amounts. Theoretically, a house could settle several feet all at once and not sustain any damage. Practically, if the amount of crawl space foundation settlement is reasonable, uniform, and is not progressing, the only concerns are cosmetic. When portions of a crawl space foundation settle differentially, many problems emerge. Some of these could be vertical cracks in the crawl space foundation, uneven floors, drywall cracks, chimneys pulling away from the house, and tight doors and windows. Some of these problems can be tricky to fix and sometimes it will not be practical to get things back to a level and plumb condition. Foundation settlement is not always the big problem it may look like to a homeowner. If the settlement has already created a structural hazard, it will need to be addressed, and should always be evaluated by an crawl space foundation repair specialist. 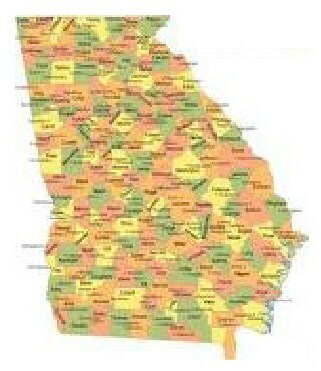 There are not many gray areas with foundation settlement. 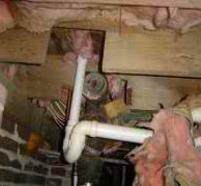 The actual mechanics and possible reasons for excessive settlement of crawl space foundations can be very complex. It is usually a case of repairing it and the costs generally varies from job to job. What this entails varies tremendously based on what damage has occurred. 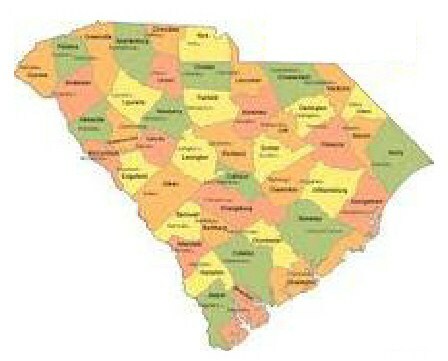 "Serving all of Georgia and South Carolina"
"A house can settle all at once and not sustain noticable damage"
Settling of pier columns in a crawl space foundation is most often caused by weak foundation soils. Over time, these soils shift and settle with changes in moisture content and density, causing movement of the pier columns and the beams above. Sagging beams and floor joists are often the result of improper spacing of existing pier columns, effectively overloading the beams and causing them to bend and sag. Excess moisture and wood rot can also cause beams and joists to weaken over time. Inadequate pier design is quite common under pier and beam homes where an inexperienced contractor has tried to install a makeshift support. The most common defective supports used are wooden stiff legs, which is a piece of wood stuck in the ground under the structure. Be it the architect, builder, or repair contractor at blame, there are many defects to be found within the walls and floors of a home. These defects can undermine its structural integrity and cause the need for foundation repair. Many homes lose their intended functionality because of those defects, and the owner is left unhappy and confused about why their home is so distressed and fatigued. "Settlement or structural defects are sometimes caused by poor construction or architectural design"
The most common defect is unsupported walls. A wall rests on a floor. The floor rests on foundation supports that connect the weight of the structure to the ground. When the connection to the ground is missing, the unsupported wall pushes the structure down, bowing the floors, pulling the roof and superstructure down with it. 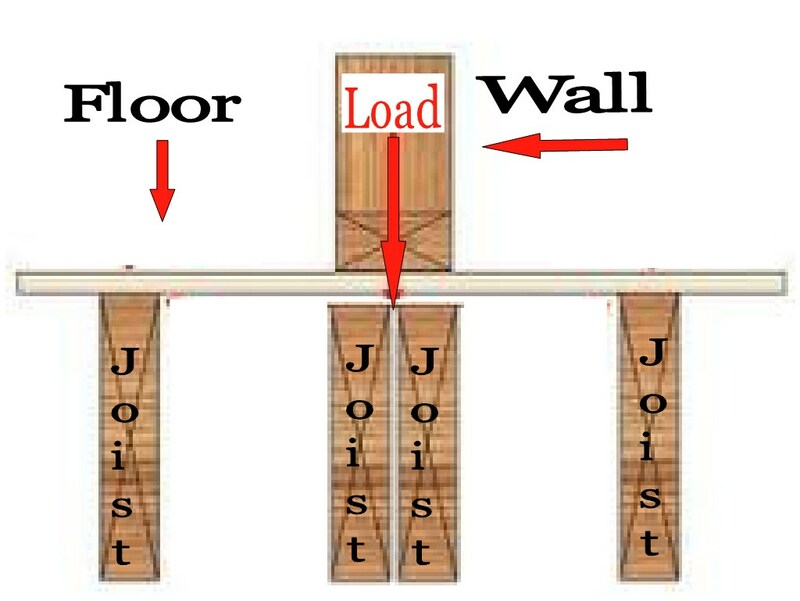 Where non-bearing partitions walls run parallel to floor joists, the joist under the partition is doubled to support increased loads frequently occurring adjacent to the partition. Sometimes we'll find a load bearing wall has been built in the same direction as the floor joists, and is IN-BETWEEN the floor joists. When a heavy wall rests on floor boards with nothing underneath, it bows the floor down, causing a sag in the floor. Load bearing walls are normally placed over the beams, piers or foundation walls that support the floor system. 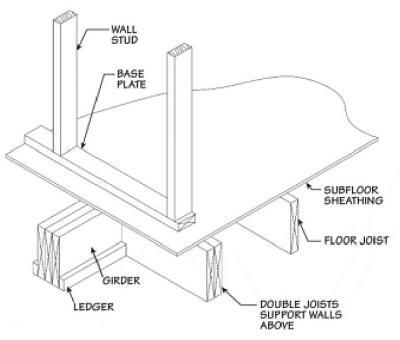 In some cases, the load bearing wall was built over a single floor joist, the wall is too heavy for the joist, and the joist will need to be doubled-up to better support the weight above. "Load-bearing and partition walls that are improperly supported are also a common defect"
One common defect in older pier and beam homes is missing girders. It is quite common to see nothing but a sill plate under the load bearing walls. This can be seen often under the outside walls, but can be found as well under the center wall of the house, and also in other areas. 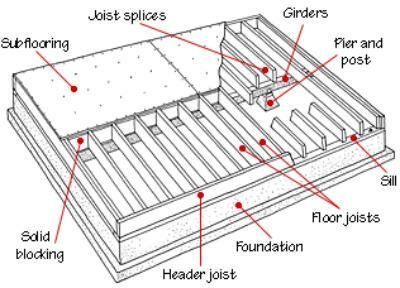 The floor joists, flooring, and walls, all rest on this flat piece of wood called a sill plate (called a plate because it is flat like a plate). This plate can bend like a rubber band, causing the floor above to easily sag and bow. A girder must be added that will support many joists together, and evenly. This can easily be remedied by placing a wood girder, beam or a doubled floor joist, up against the floor, immediately under the unsupported wall. The girder or doubled floor joists can then be lifted to raise the floor and wall to it's intended height. It can then be further supported by piers underneath that will connect it to the footing under the ground. A structure should never be built like this in the first place, but when has been, there is no choice but to correct it. "Inadequate pier design and spacing is common under pier and beam homes"
Poorly spaced piers are always a main concern with pier and beam foundations. The standard spacing of piers is about 6 feet apart. This rule will usually prevent sagging of the wood structure above. Also, if the pier supports do not cover enough area on the ground, they are likely to settle into the ground. If the piers rest on a base, or a concrete footing, it covers more area, and it will distribute the weight more successfully. More piers will, of course, share the weight of the structure more successfully than less piers. Sometimes stacked up bricks are used, and even sticks of pipe. If the support does not cover a large area at the bottom, it is usually a poor support, and needs to be replaced. Under a pier and beam structure, depending on the weight of course, a poured in place footing about 1 foot in the ground, and about 2 feet by 2 feet, will usually support most pier and beams, if they are placed on no further than 6 foot centers. A main concern of a pier and beam structure involves undersized or poorly spaced lumber. A 4'' by 6'' wood beam or girder is usually the minimum size for a beam or girder supporting the structure. A 4'' by 4'' can sometimes be used, but it increases the chances of sagging or settlement, and the floor above may dip. If the supporting piers are placed closer together than the standard 6 feet apart, sometimes a 4'' by 4'' can be used, and a 4'' by 6'' can also sag if the piers are placed too far apart. 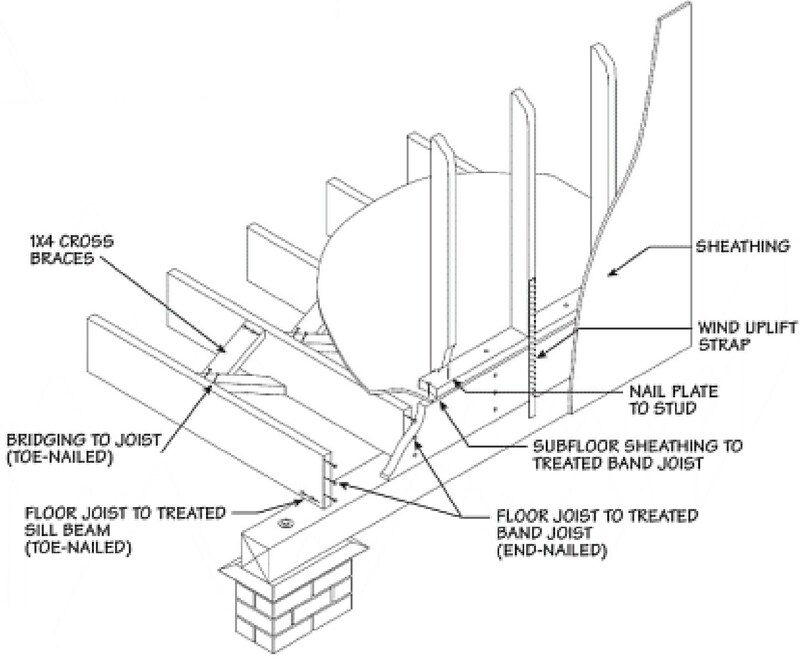 Joists are usually installed on 16'' centers, and beams or girders are rarely installed further than 12 feet apart. Engineers and architects know the proper spacing, and they know the larger the beam or joist, the greater the spacing that can be allowed without sagging and settlement, depending on the amount of weight above. In cases where poorly spaced or undersized joists, beams or girders are recognized, aditional lumber can usually be added to give it strength, without the added expense of replacing any lumber. Floor joist sizes range from 6'' to 12'' in pier and beam foundations. 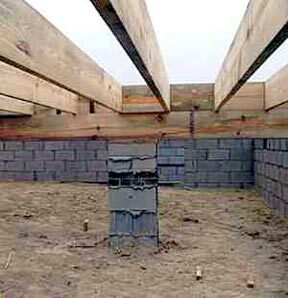 The standard is an 8'' joist, but in some houses a 12" is used. The larger the joist, the longer the span it may reach without causing a sag or causing the above floor to shake. "Improper sizing and spacing of floor joist, beams, and girders increases the possibility of sagging and settlement"
Another construction mistake is when a plumber or air-conditioning installer decides that the floor joists are blocking the path of his pipe or vent that he must install, so he just CUTS the joists or girders he needs to fit in his material. 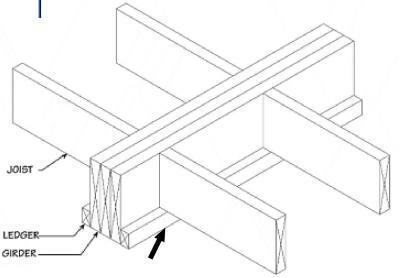 This cutting of the structure forms a cantilevered support, this weakens each side of the cut joist or girder, and weakens the strength of the structural system. 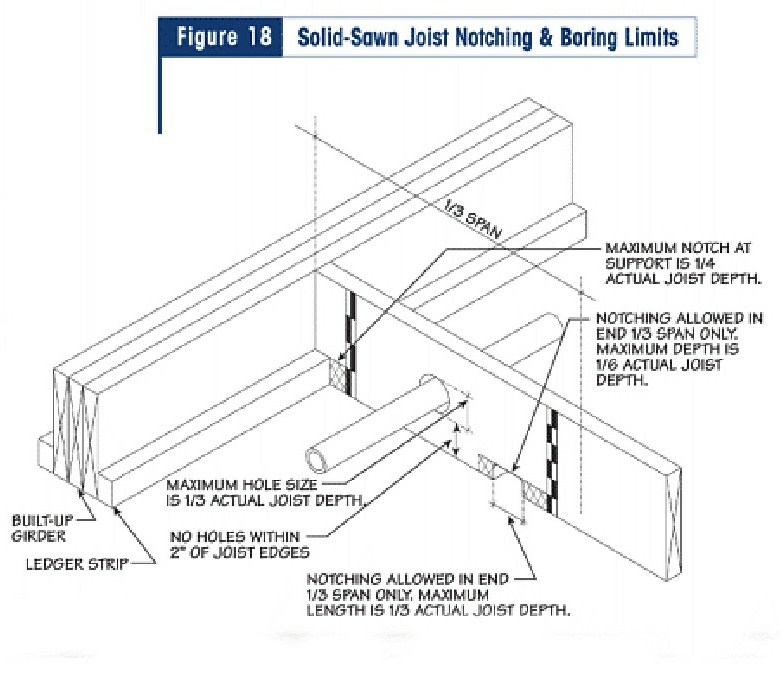 Bored holes are limited in diameter to one-third the actual joist depth, and the edge of the hole cannot be closer than 2" to the top or bottom edges of the joist. 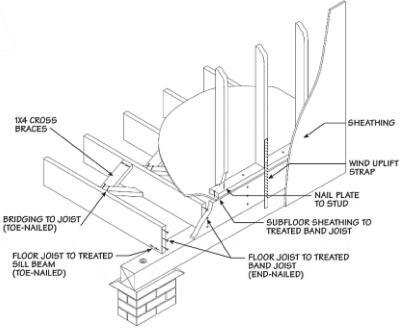 Do not cut notches in the top or bottom edges in the middle one-third of the joist span. Notches in the outer thirds of the span cannot exceed one-sixth the actual joist depth, and cannot be longer than one-third the depth. 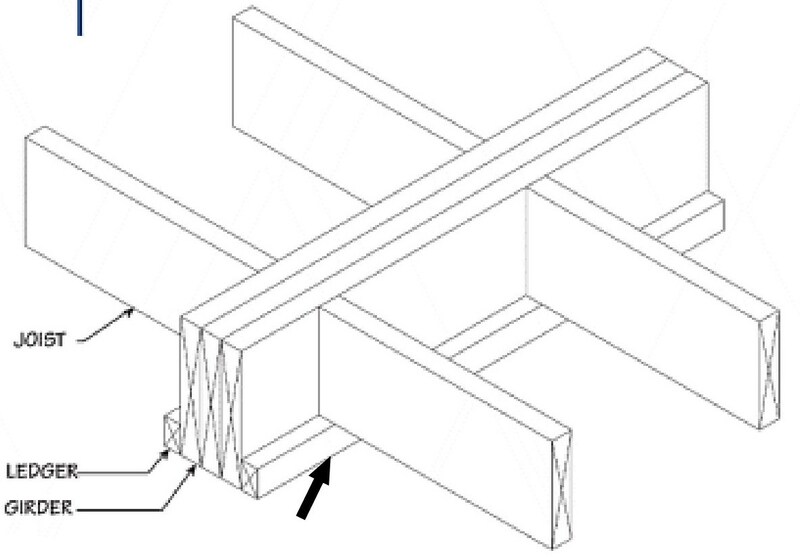 Notches made at a support, such as shown in Figure 23 for joists supported by ledgers, cannot exceed one-fourth the actual joist depth. "Cutting framing members to install mechanical components can also weaken the structure"